At Patcraft, commercial carpet is our passion – schools and government buildings, corporate environments, tenant projects, healthcare facilities and more. If you're looking for outstanding design coupled with performance and customer service, you want Patcraft. We design our institutional and educational carpets to withstand the abuse and aggressive maintenance associated with schools, government buildings, airports, gymnasiums and other high-level traffic environments. Our wide variety of performance-engineered, color-coordinating patterns and textures ease budget restrictions so specifiers and end users can coordinate rooms with transitional space such as hallways and common areas. Patcraft Commercial Carpet helps promote your corporate image with a variety of expressive, yet functional floor fabrics. Select from a wide range of textures, colors and patterns suitable for public areas as well as private workspaces and administrative spots. Attractive floors play a big part in helping property managers and building owners attract tenants. Patcraft carpet is stylish and inviting, which helps your building look its best. Whether you're renovating or building, Patcraft's flexible and coordinating product line accommodates a wide range of budgets. We're dedicated to providing building owners, property managers, specifiers, and end users with the products you want, when you want them. Today's retail environment is more competitive than ever. Merchandisers must use every available tool to build and maintain traffic while constantly eyeing the bottom line. Whether your merchandising approach is elegantly conservative or boldly striking, Patcraft Commercial Carpet has the patterns and textures to support your marketing strategy and fit your budget. Heavy roller traffic, abusive foot traffic, frequent spills, and crisis maintenance are just a few of the demanding issues healthcare facilities face daily. Patcraft supports healthcare specifiers and end users with a variety of performance-oriented, ADA-compliant floorcoverings, each one designed to endure heavy gurney traffic and minimize wheelchair friction. We also produce several healthcare options with antimicrobial protection and 100% solution-dyed nylon fibers that are easy to clean. 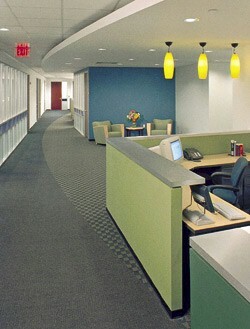 Carpet provides economic, aesthetic, and performance advantages matched by no other floorcovering. That's why the senior living industry has embraced carpet as a major design element. With Patcraft Commercial Carpet, the sterile, uninviting interiors usually associated with hospitals, HMOs, and geriatric centers are a thing of the past. Carpet improves sensory qualities while enhancing the emotional and psychological effects of healthcare patients and workers. And, with Patcraft Commercial senior living products, you get added benefits like stain-resistant, solution-dyed nylon and antimicrobial treatment, which controls bacteria when those unexpected spills occur.